June 21, 2017 - New video shows just how afraid of humans cougars really are. 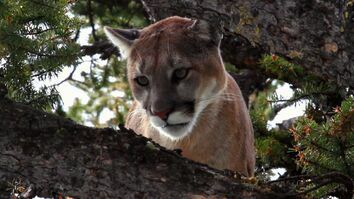 Researchers tested how feeding cougars reacted to recordings of human voices, including Rachel Maddow and Rush Limbaugh. While recordings of frogs elicited no flight response, the cougars frantically escaped as soon as the human voices were played. This could have important effects on predator-prey relationships. 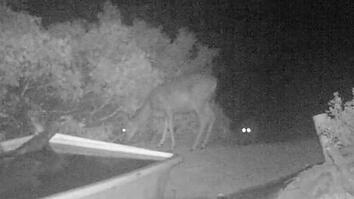 Habitat loss and fragmentation is rising, which leads to decreased feeding time as more people cross their paths. After hearing humans, cougars reduced their feeding time on kills by about half. This causes a 36% increase in their kill rates in areas with high human activity, which further increases the chance of encountering humans. Click here to read Cougars Are Terrified of Human Chatter—And That's a Big Problem. Click here to read the study about cougars and human voices. 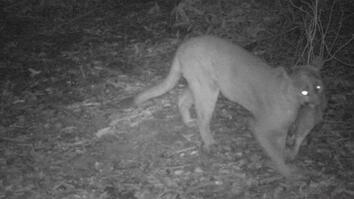 Click here to read more about the Santa Cruz Puma Project.